The Taliban have claimed responsibility for Wednesday's attack on a U.S. base in Afghanistan. 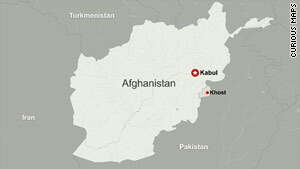 Kabul, Afghanistan (CNN) -- An American intelligence official vowed Thursday that the United States would avenge a suspected terrorist attack on a U.S. base in Afghanistan that resulted in the deaths of seven CIA officers. Two of those killed were contractors with private security firm Xe, formerly known as Blackwater, a former intelligence official told CNN. The CIA considers contractors to be officers. A current intelligence official confirmed that the casualties included a mix of people -- CIA staff and contractors. Six others were wounded. The Taliban has claimed responsibility for the attack, which occurred on Wednesday. A senior U.S. official said information suggested a bomber walked into a gym facility at Forward Operating Base Chapman -- located in the Khost Province near the border of Pakistan -- and detonated bombs in a suicide vest. It was not known how the bomber got past security. In a posting on its Web site Thursday, the Taliban claimed the bomber was an Afghan National Army soldier. "This attack will be avenged through successful, aggressive counterterrorism operations," the intelligence official vowed. "There are some very bad people who eventually are going to have a very bad day," the official promised Friday. Flags at CIA headquarters in Langley, Virginia, flew at half-staff Thursday. "These brave Americans were part of a long line of patriots who have made great sacrifices for their fellow citizens, and for our way of life," U.S. President Barack Obama said in a written statement Thursday. "The United States would not be able to maintain the freedom and security that we cherish without decades of service from the dedicated men and women of the CIA." Richer, who retired from the agency in 2005 as the associate deputy director for operations, knew many of Wednesday's victims personally. In a written statement Thursday, he called on the public to "remain mindful that our great country is served well by those in and out of uniform. That officers like those lost in this attack placed themselves in harm's way, at a critical and dangerous crossroads in the war on terror. "We should be thankful for the service and sacrifice of these fine Americans. They and their colleagues, who compose the very thin line of Agency officers working in the shadows at the very tip of the war on terror, are a national asset; an asset often misunderstood and under appreciated." CIA Director Leon Panetta said in a separate statement Thursday that "those who fell ... were far from home and close to the enemy, doing the hard work that must be done to protect our country from terrorism." A U.S. intelligence official would not discuss the specific mission of the base, but did acknowledge that it was a crucial CIA post and a "hub of activity." The main purpose of CIA forward operating bases in Afghanistan, officials have noted, is to recruit informants and to plan and coordinate covert operations -- including drone surveillance and targeting. The Khost Provincial Construction Team has been located at Chapman for about eight years, focusing on government, communication, security, agriculture and development in 13 districts, according to Capt. Michael R. Andrews, a U.S. Air Force spokesman. Another U.S. military source had said earlier that the Khost Provincial Construction Team had left Chapman some time ago. The U.S. State Department, U.S. Agency for International Development and U.S. Department of Agriculture also have personnel at Chapman, Andrews said. CNN's Barbara Starr, Pam Benson, Atia Abawi, Suzanne Simons and journalist Matiullah Mati contributed to this report.